The Chinese zodiac dog and tiger relationship can be fun and happening. Will the fun be enough to carry them into a long term relationship? Will the Dog and Tiger soulmates be able to have a successful relationship? Will these two have to work hard to be happy? According to Chinese astrology predictions, the dog and tiger relationship will be full of compassion and kindness. They will have a lot of fun and satisfaction from being together. Chinese zodiac compatibility says that the dog dating the tiger will form an almost perfect match. These two will typically not have the same kind of problems that other couples will. They will both have the capability of overlooking each other’s negative aspects and never think of a breakup. The two Chinese zodiac signs of the dog and the tiger are honorable and will want to protect the ones they are closest to. They will be able to provide security to each other when they are in a relationship that is intimate and sensitive. The tiger will need to find a way to balance this. They do not like relationships that are suffocating. However, in a relationship with the male or female dog, the man or woman tiger will feel they are being protected along with their desires and needs. They will be more than happy to make the dog man or woman feel the same. They are honorable, kind hearted and brave. The dog will be more than happy to receive that kind of attention. They can have some issues when it comes to trusting others and they also have a tendency to be somewhat negative. But their lover will make them feel secure. In a dog and tiger marriage, they will be very good at accepting each other’s individual traits. This is very important to the male or female tiger. The tiger requires a certain amount of independence to be happy. They might find this difficult to achieve in many different relationships, predicts Chinese compatibility. Since the dog is prone to having mood swings from time to time, they will understand the need for alone time. They will both want to follow their own paths. Both will be honorable and honest. This will make it easy for both of them to admire each other and respect each other’s choices in the dog tiger friendship. The tiger respects the dog’s loyalty. The rational dog respects the tiger’s spontaneous and somewhat impatient nature. They can help calm the tiger’s excitable nature and keep them from making impulsive decisions. The dog and the tiger in love are both charismatic, good looking, and attentive. This will also make their relationship sexually satisfying in bed for both of them. The dog will rarely be clingy. The tiger will feel secure and at the same time will be able to express their independence. The tigers will disregard the dog’s negative thinking and will be able to boost the their mood when they are down. A dog husband and tiger wife might seem like it is not a good match. However, both place great importance on their freedom. These two will be very fair to each other. The tiger will adore the dog’s charitable nature. At the same time, the dog will adore her excitement, strength, and liveliness. A dog wife and tiger husband might be able to share ideal love compatibility. The tiger’s strength will help the dog’s charitable goals become more attainable. They communicate very well with each other and always have something to talk about. They might argue when it comes to the tiger willing to quit their job without consideration. Additionally this will cause the dog to be concerned about money. 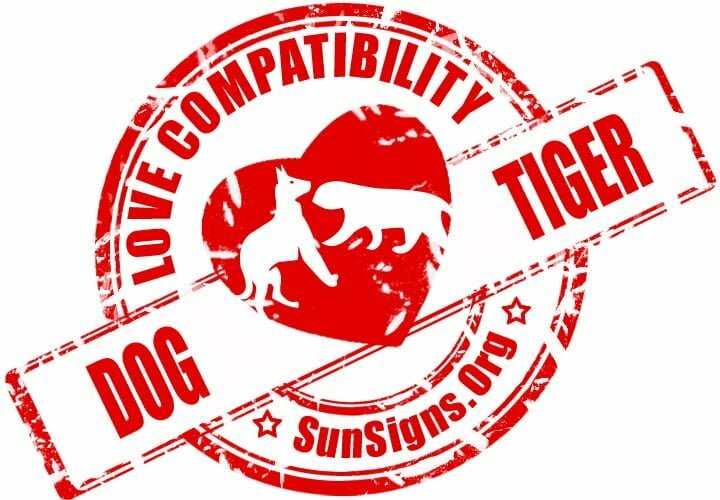 Dog & Tiger Chinese Horoscope Compatibility Rated 5 Hearts!